Test quality ZIF test socket mounted on a circuit card with 18 mil round pins spaced on 0.1 inch centers to fit into standard automatic tester socket. SOT23-6-D3-ZL 3 Pin SOT23, TO-236 to DIP adapter with closed top ZIF socket. MO178-5-D3-ZL 5 Pin MO-178 to DIP adapter with closed top ZIF socket. Bottom pins are DIP rows 300 mils apart. Pins are wired signal to signal from PIC10F20x SO-23 to DIP pins. 10QFN-D6-ZL-S 10 Pin 10 Pad QFN closed top ZIF socket. Pins are wired one to one. 20QFN20L-D6-ZL-P 20 pad QFN MLF adapter is wired one to one. QFN pin 20, center QFN contact on the chip side facing adapter PCB pins DIP 1 and DIP 20 is connected to pin DIP 1. All other pins are one to one. 24QFN16-D6-ZL-P 24 pad QFN MLF adapter is wired signal connection one to one. 248QSO30A-D3-ZO 24 Pin ZIF socket adapter for devices in 4.4MM wide body SOP packages. Generic one to one wiring. 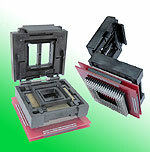 24SSOS15-D6-ZO 24 PinSSOP ZIF socket adapter for devices in 6.0mm (154 mil) wide body packages. Generic adapter, pins are wired 1 to 1, DIP pin to socket pin. 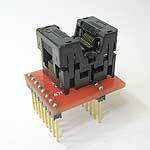 32QFN20-D6-ZL-P 32 pad QFN MLF adapter is wired one to one. 32SO30-D3-ZO 32 Pin ZIF socket adapter for devices in 300 mil wide body SOJ packages. Generic one to one wiring. 40SO44-D6-ZO 40 Pin adapter for devices in 440 mil wide body SOIC packages. Generic one to one wiring. 44PL-D6-ZAL 44 Pin PLCCOpen top ZIF socket to DIP male pins. This adapter is wired one-to-one. 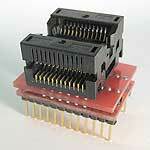 44SOJ40-D6-ZO 44 Pin adapter for devices in 400 mil wide body SOIC packages. Generic one to one. 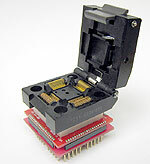 48QFN20-D6-ZL-P 48 Pin adapter for 7 x 7mm body, 0.5mm pich packages. Generic one to one. 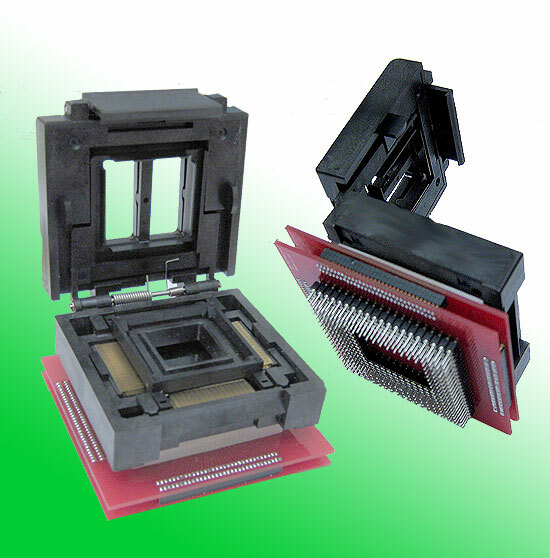 48QFN20-ZL-SD2-P 48 PinMonitor pin adapter for 7 x 7mm body, 0.5mm pich packages. Generic one to one. 56QFN20-D9-ZL-S-L 56 Pin QFN The adapter is wired one-to-one. 56QFN20-PG-ZL-S-L 56 Pin QFN The adapter is wired one-to-one. 56TS09-D9-ZO-S 56 pad ZIF Test socket for SSOP package to DIP breadboard adapter converts SMT package with pitch of 5 mm to two 900 mil DIP pin rows. DIP pin 1 is connected to SSOP pin 15 and DIP pin 56 is connected to TSOP pin 14 so that this adapter can be plugged directly into a DIP socket for the same chip in a DIP package. 56TS20-D9-ZO-S 56 pad ZIF Test socket for TSOP package to DIP breadboard adapter converts SMT package with pitch of 5 mm to two 900 mil DIP pin rows. DIP pin 1 is connected to TSOP pin 15 and DIP pin 56 is connected to TSOP pin 14 so that this adapter can be plugged directly into a DIP socket for the same chip in a DIP package. 64QFN20-D9-ZL-S-P 64 Pin QFN The adapter is wired one-to-one. 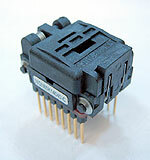 64QFN20-64D9-ZO-S-P 64 Pin QFN The adapter is wired one to one. 64TST2-47-ZO-D6 64 Pin TSOP Type 2 The adapter is wired one to one. 66SSOS40-D9-ZO-S 66 Pin SSOP socket on a .1 inch hole pattern male pin breadboard pattern. DIP rows pins are 0.9 inches apart. 80QFS20-PG-ZL 0.5mm Pitch, 8O Pin TQFPsocket to wire-wrap pins for a 0.1 inch breadboard hole pattern. 80QFS26D-PG-ZO-S 0.65mm Pitch, 8O Pin TQFPsocket to wire-wrap pins for a 0.1 inch breadboard hole pattern. 84PLCC-84D15-ZO-S 84 Pin PLCC PLCC socket on a .1 inch hole patten male pin breadboard pattern. DIP rows pins are 1.5 inches apart. 100QFS20-QF-ZL-SD 100QFP adapter with hinge lid test ZIF QFP socket on a .1 inch hole pattern male pin breadboard pattern. 100QFR26C-PG-ZL-2-S 100QFP adapter with hinge lid test ZIF QFP socket on a .1 inch hole pattern male pin breadboard pattern. 100QFR26C-PG-ZL-6-S 100QFP adapter with hinge lid test ZIF QFP socket on a .1 inch hole pattern male pin breadboard pattern. 144QFS20-PG-ZO-S 100 QFP adapter with hinge lid test ZIF QFP socket on a .1 inch hole pattern male pin breadboard pattern.